We have been undertaking a photographic record of headstones in various Municipalities for everyone to utilize for family history purpose. 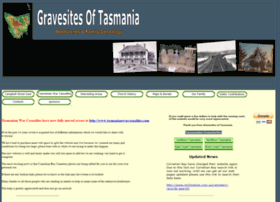 We have almost completed coverage of Southern Tasmania with only a few Municipalities to go. Our aim is to ensure we can preserve a digital image before time and weather erodes the headstones and an image will last forever. Unfortunately some graves have been called unknown as they are un-readable.